These are all single mic systems, but it is common to purchase several of these together. Each mic and receiver combo will tune to a slightly different frequency or channel so they don’t interfere with each other. 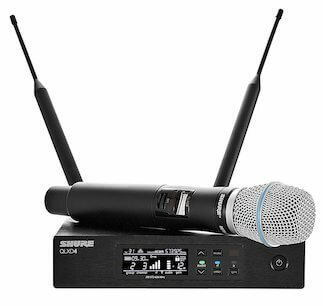 The Shure PGXD24/SM58-X8 Wireless Microphone operates in the 900 Mhz band. It has 24-bit digital audio, runs on 2 AA batteries, and is built like a tank. You’ll have a 200-foot range and an extra 10dB gain on the mic if you need it. This is a great value and will last a long time. You can use up to 5 systems together, so if you think you will need more than that over time, I would look at some of the higher end systems. 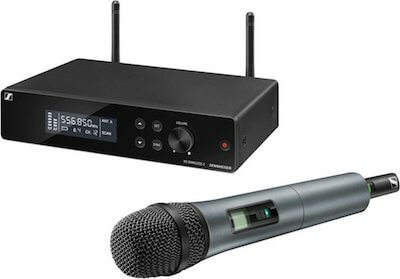 The Sennheiser XSW 2-835 dynamic handheld wireless mic is a solid “entry” to “mid-level” choice. You can use up to 12 of these together, they are rack-mountable, and have automatic frequency management for easy setup. This is a common choice for churches looking to go wireless. 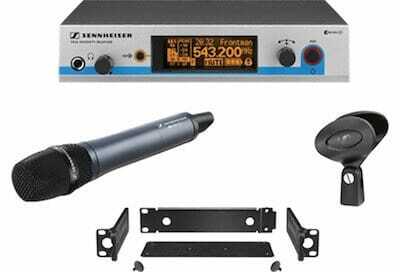 You can pair this with lavalier mics, headset mics, and more. Here’s another SM58 wireless mic, in the Shure GLXD24/SM58. It operates in the 2.4GHz frequency band (usually what wireless routers use). Instead of AA batteries, this mic uses rechargeable lithium-ion. Under normal conditions, you get about a 100′ range. 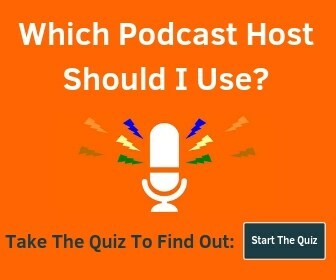 Combine several of these with a frequency manager to have the system automatically choose separate available frequencies for each mic. The Audio-Technica ATW-3212 is a brand new update to the 3000 series as of June 2018. The new 4th generation models have a wide 60 MHz tuning range and an updated design. It comes with a cardioid dynamic mic in the UHF frequencies. 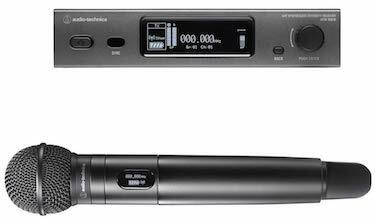 With the 3000 series, you can use up to 16 mics per band and you get a 300-foot operating range. Great for decently large spaces. We’re stepping up in quality with the Sennheiser EW 500-935 G3 (and really, from here on). I’m linking to the dynamic cardioid version, but Sennheiser also offers a dynamic supercardioid and a multipattern condenser version as well. There is an ethernet port, allowing you to use the wireless system manager to monitor and control each of your mics. This is a very high-quality cordless mic and highly recommended for singers and live vocal performances. The KSM9 microphone typically runs around $700 in a wired configuration. It is a handheld condenser with a switchable polar pattern between cardioid and supercardioid. Here we see it in the QLX-D line with the Shure QLXD2/KSM9. The QLX-D is a digital system with 24-bit audio, AES 256-bit encryption, one-touch sync, and an Ethernet port for networked channel scanning when multiple receivers are used. 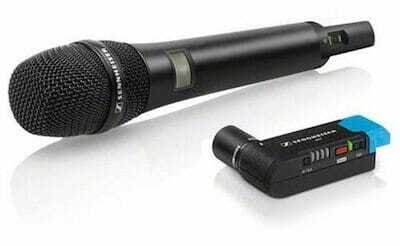 All the QLX-D mics can use AA batteries or a rechargable lithium-ion. Pair with the QLXD4 Receiver. Just keep the frequency ranges the same (I’ve recommended the G50 model for both) and stay away from the J50 and L50 models as those are no longer allowed. 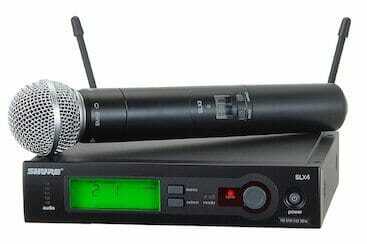 The Shure QLXD24/B87A is the BETA 87A handheld wireless mic combined with a QLXD4 receiver. This is the same QLX-D wireless system mentioned right above here. The Line 6 V75-40V is basically the Earthworks capsule on top of the microphone body that comes with the Line 6 XD-V75 wireless kit. You’re better off getting the kit and capsule separately. We’ve had a few different selections from Shure, but the SLX24/SM58 is the first from the SLX wireless line. You get 960 selectable frequencies across the 24 MHz range each unit provides. There is automatic frequency selection, detachable antennas, and a 300-foot range. The receiver has both 1/4″ unbalanced and XLR balanced outputs. The SLX line has a full range of accessories and additional transmitters for the whole band, including instrument mics, lavalier mics, guitar inputs, and a bunch of handheld options. Lastly is an option designed for video recording. The Sennheiser AVX 835 operates in the 1.9Ghz frequency range, which doesn’t require licensing in most countries. The receiver plugs into an XLR port, but it also comes with an XLR to Aux adapter so you can plug it into pretty much any DSLR. Rock solid stability. They’re not cheap, but the AVX system is one of the best wireless systems to record audio for video. Need more DSLR audio? Check out the best on-camera DSLR shotgun mics. You can get 2 of any of the single mic wireless sets above to create a 2 mic “set”, but I wanted to highlight a couple options that include a single receiver. 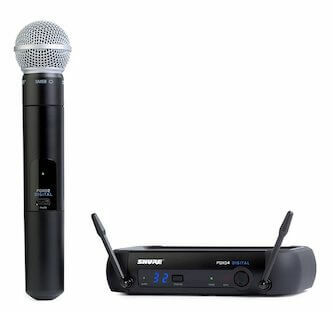 The Shure BLX288/PG58 is a great budget option to get 2 wireless microphones and 1 dual-channel receiver that sounds great. BLX is Shure’s “cheap” wireless line and a great starting point without breaking the bank. You’ll get great wireless range as well. I haven’t mentioned the ULX line yet, but it is Shure’s top of the line wireless series. 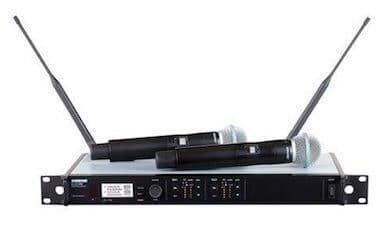 The Shure ULXD24D/B58 kit is a rack-mount ready dual receiver with two BETA 58A microphones. It is compatible with Dante digital networking (the dual & quad receivers are, the single ULX receiver is not), has 2 Ethernet ports for easy expandability, and has unmatched wireless control and stability. I’m recommending the G50 model which is between 470-534MHz. Stay away from J50 and L50 as they’re discontinued because they overlap into the newly restricted frequency range. And don’t forget about the optional SB900A rechargeable lithium-ion batteries and compatible charging stations. 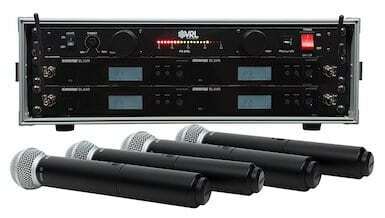 This is a kit that includes 4x Shure BLX24R/SM58 systems, a rackmount box, and a power supply. 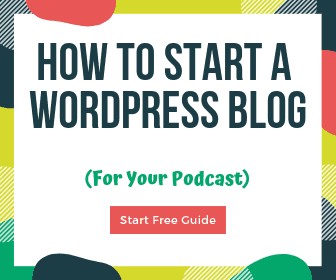 This is a nice easy way to get started – just make sure you confirm with the seller that they have the frequency bands you need. This isn’t a set, but the Shure ULXD4Q is a quad receiver in a 1U rackmount. This is compatible with the dual ULX receiver mentioned above in the 2 mic set. Unless you absolutely have to, I would avoid Pyle and VocoPro wireless systems as you will likely run into frustrating issues – they’re overly cheap for a reason. You can also use this wireless frequency finder tool from Shure to find which frequencies are available in your area. Any other recommendations or tips for setting up handheld wireless mics? Let me know in the comments!